Excellent drama and story so far! Once again, I’m addicted to Lee Jong Suk’s works. I am looking forward to this week’s episodes. I have been waiting for DY to realise that she has feelings for ES. The day has come and it would be interesting to see how he kept teasing her until the situation becomes serious. Immediately when I saw the first episode, I was like, she isn't supposed to marry this guy. Sometimes you have to just let the universe have it's way because eventually it will. It wasn't enough that she flew the scene clad in wedding dress, but CEH's car got towed. Her veil blew into the trees, the signs all pointed to GO, do not stop, do not collect $200, get the heck out of there. The scene when CEH finally comes to terms with his feelings and realizes that he shouldn't have "let her go" 12 years ago, I couldn't help but remember that opening scene. The universe was trying to tell both of them. Now here we are 12 years later and both of them have suffered for being blind. We don't have the full backstory on his family life, but I imagine that has more to do with him not committed to KDN that her getting married. He seems to be a bit cut off from commitment and intimacy. He knows how to establish friendships, but he still keeps people at a distance. You can see that with almost every relationship in his life, including his friendship with KDN. It was very telling that she had gotten divorced, sent her kid overseas, was squatting in her old house and then homeless all the while desperately looking for a job. Here he is her best friend and he was clueless to it all, even though she had sort of told him the truth. He felt responsible for what happened to her because he knew 12 years ago that her husband was trash. She knew it too, but she didn't have anywhere else to go. She didn't have a plan C and so she was stuck with the jerk hoping if she cosplayed the perfect wife, things would work out. He left her in such a cruel way because I imagine nothing else he did would've worked. She would've forgave and stayed. One thing I love about her development in this drama is it shows women who are brainwashed into believing marriage and kids is the end all to their lives that they can have another identity. They don't just have to be mom or wife or daughter-in-law. They can have hobbies, interests, passions and careers and it is okay to be self-sufficient. It is okay to love yourself and at times, put yourself first. She settled BIG time when she got married. Here she was successful, smart, and moving up in the world of advertising, which is why her husband wanted to marry her. But once she gave that up and the family had to depend on him, when clearly he is a loser, everything went south. I so loved the scene in episode 8 when she partied with Team Leader Seo and Director Go. I was afraid she was going to spill the beans on her former life, but she just revealed that she too was divorced. Can I just say that the acting in this drama is top notch. When Team Leader Seo shared the fight she had with her husband when he didn't take up for her at the shoe store, I felt her pain. I also liked how we saw the chaos that Manager Go was living in. Her home truly reflects her messy feelings. She isn't just lonely from a relationship. She is lonely from not really having friends and people to talk to and connect with. I hope these ladies remain in connection with each other and get close. As far as JSJ, I pretty much thought he was harmless until episode 8. Maybe he is a long lost son. Maybe CEH's father wronged him somehow. But when they revealed his panic room with all of that information on the writer, the hair stood up on the back on my neck. He is obsessed! KDN will have to be careful around him. I don't know what his end game is, but I feel that there is another piece of information yet to be revealed about CEH. I can't wait to see what it is. Great drama so far. @nubianlegalmind I must say you actually wrote things I started thinking now that I watched the episode properly with subs. I don’t know ’long lost maybe son’ is giving me the creeps. Also let’s not forget he pretended to go work so he could go on a date with Dan-i. Now why would he do that? However I can’t wait for new episodes. ...This is the kind of episode that leaves me with that perfect drama hangover. I am Dan-yi, sprawled out on the kitchen floor, just waiting for next week. 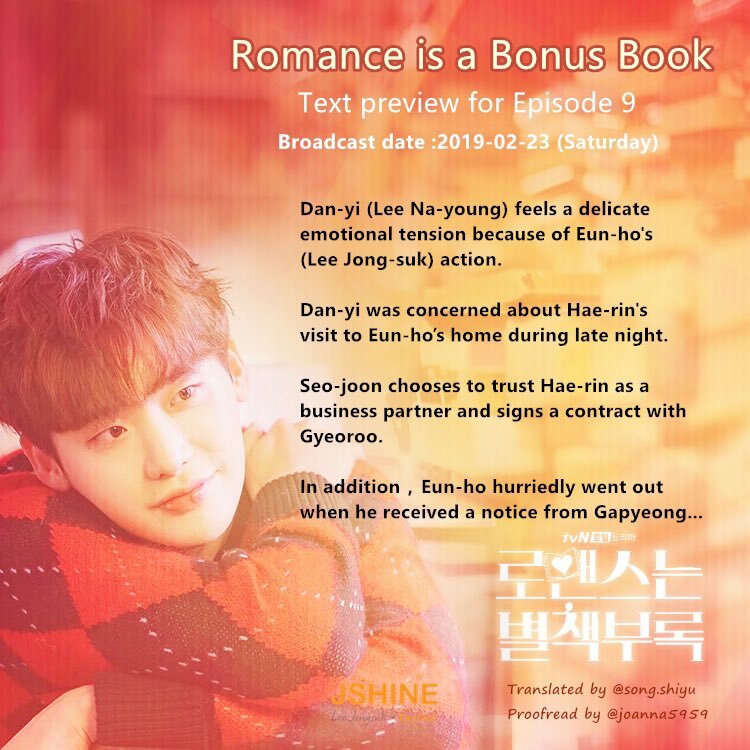 The preview for episode 9 looks fun but uh-oh... the text preview is making me worried. I feel that we're only being teased by the cute, warm and fuzzy preview but they are going to drop some major revelations and dramatic emotions on us. Appreciation for Seo Young Ah - Bong Ji Hong's scenes this week! Their plot is so well etched out without indulging in too much of a backstory. A couple that gradually falls out of love. The discontent that has been hidden away so long that it erupts in the most ugly and unexpected manner. "Of course I wanted to buy the shoes." But we know the issue was never buying of the shoes. Seo Young Ah just got frustrated waiting for the husband to see how she is feeling all this while. Please do not quote images, thanks! – I had nowhere to go. – I’m your home. You can always come to me. You and I are a “we”.